This Mod overhauls the main workbench script to allow for more custom recipes. 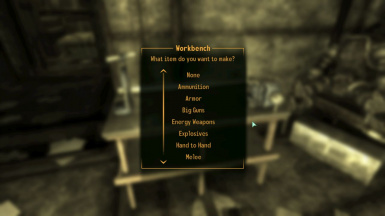 Workbench and Crafting Expansion v2_552 Fix To fix this mod, be sure to do it! ***NEW: CRAFT version with included, optional, FOOK and FWE patch. It requires the CRAFT Mod to work. See Readme files included with CRAFT version for updated info. The below information is for the old non-CRAFT version. Extract the included ESP files into the Data folder located within your main Fallout 3 Directory. Activate whichever one you prefer via the F3 Launcher or FoMM. DO NOT ACTIVATE BOTH. version only expands the Workbench menu options and does not add any new recipes. It also includes various custom recipes as well. - Steam Cannon may cause VATS and/or game to freeze if you run out of ammo and are forced to reload during it. If this happens, try opening the console and interacting with the menu to load the ammo there. That should unstick VATS after you close the console. recipe, feel free to contact me. Dragon's Breath Shotgun: Same as regular Sawed-Off Shotgun, just does slightly more damage, sets things on fire and has the fire critical, and uses the Zhu-Rong's ammo explosion. Excavator: Railway rifle with less range, but its projectiles explode on impact. Damage and radius about half that of a Frag Grenade. Flashbang: Cripples the Head of anyone in range of the explosion and reduces Perception to 0 for 10 seconds. Gattling Shotgun: Minigun that fires Shotgun Shells. Does more damage and has a larger bullet-spread. Incendiary Grenade/Mine: Same as Frag Grenade/Mine, does fire damage, set things on fire, has the fire critical, and has slightly increased explosion radius/damage. Infiltrator Headgear: Shady Hat with Combat Helmet DR.
Meat Cannon: Rock-It Launcher version that uses meat as ammo. Slightly less damage, poison damage type, centaur spit critical chance. Mega Power Fist: Slightly less than double the damage of a Power Fist. Knocks target back. Molotov Cocktail: Half the damage of a Frag Grenade, does fire damage, set things on fire, has the fire critical, and explodes on impact. Needler: Rapid-fire version of the Dart Gun without the poison/crippling effect. Precision Laser Rifle: Sniper Rifle that fires a laser. More accurate and can fire numerous shots in succession, but does less damage and has a shorter range. Pulse Rifle: Same as Plasma Rifle, but does 155 extra damage to robots (for a total of about 200, like a Pulse Grenade). Stealthboy Recon Armor: Just like Recon Armor, only replaces the +5 sneak bonus with a 25% Stealth-field when sneaking. Steam Cannon: Rapid-fire version of the Rock-It Launcher that can only use Pool Balls or Baseballs as ammo. Weighs more. Dragonbreath Shotgun: Karl, Doctor Lesko's Shack, & Megaton Armory. Excavator: Seagrave Holmes, Knickknack, & Wheaton Armory. Gattling Shotgun: Successfully disarm a Shotgun trap with an intelligence of 6 or higher. Incendiary Grenade: Successfully disarm a Grenade Bouquet trap with an intelligence of 6 or higher. Incendiary Mine: Jocko's Pop Shop. Infiltrator Hat: Moira Brown, Chinese Ghoul Hideout, & Yoo Guai Cave. Meat Cannon: Crashed Satellite Hideout, Germantown Police HQ, & Dunwich Building Underchambers. Mega Power Fist: Quartermaster Durga, Raven Rock Level 2, & National Guard Armory. Needler: Pronto, Mr. Burke's House, & Old Olney Sewers. Precision Laser Rifle: Quartermaster Durga, Rivet City Bridge Tower Armory, & Fort Constantine CO Quarters. Pulse Rifle: Successfully disarm a CPU trap with an intelligence of 6 or higher. Stealthboy Recon Armor: Quartermaster Durga, Fort Independance, & Ranger Compound. Steam Cannon: Successfully disarm a Baseball Machine trap with an intelligence of 6 or higher. Qzilla - Sneak activated Stealthboy Recon Armor. Surgical Scar - Excavator & Ammo, Flashbang, and Needler. Panpiper - Gattling Shotgun, Infiltrator Headgear, and Steam Cannon. refsil - Noticing that I was using the wrong formID for the Flashbang's projectile. Demontriplet - Finding a way around the ammo-load in VATS freeze.